The winners of the 2013 European Border Breakers Awards ("the EBBAs"), highlighting the best new music acts in Europe which have achieved cross-border chart success, were honoured recently at the Eurosonic Noorderslag festival at Groningen in The Netherlands. The biggest winners of the night were French DJ collective C2C, who scooped the public choice award, which was announced live during the ceremony following an online vote to select the 'best of the best'. A four-time winner of the World DJ Championships, C2C mix jazz, soul, blues, electro and hip-hop. Originating from Nantes, the group is comprised of four DJs - 20Syl, Greem, Pfel and Atom. Their No1 debut album, ‘Tetra’, achieved platinum (100,000) sales in France and also charted in Belgium and Switzerland. 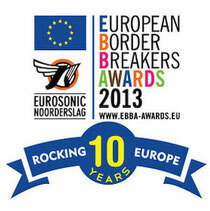 The award ceremony featured performances by C2C and six of the other ten winners of the 2013 European Border Breakers Awards: Nabiha (Denmark), Ewert and The Two Dragons (Estonia), French Films (Finland), Dope D.O.D. (Netherlands), Amor Electro (Portugal) and Juan Zelada (Spain). There were also performances by previous EBBA winners: Saybia, Alphabeat and Katie Melua. Of Monsters and Men (Iceland), Niki and the Dove (Sweden) and Emeli Sandé (United Kingdom) sent video messages.